John and Mandy Nippert and their sons Levi, Isaiah and Samuel,seated in Santa’s sleigh at the bazaar. The sleigh that was a focal point during the Christmas bazaar held at Cardington-Lincoln High School. It is surrounded by the 15 Christmas trees decorated by several grades and organizations at the school. The Cardington Holiday Bazaar, held Saturday, Nov. 17, at the high school, introduced the holiday season. The bazaar featured 70 vendors and student/nonprofit groups and performances by students in kindergarten through fourth grade, the Drama Club, and Rising Stars Academy. More than 2,000 people attended and were given the opportunity to take pictures on Santa’s Sleigh and to vote on decorated trees. New this year were two features, Adopt-A-Tree and Santa’s Sleigh. 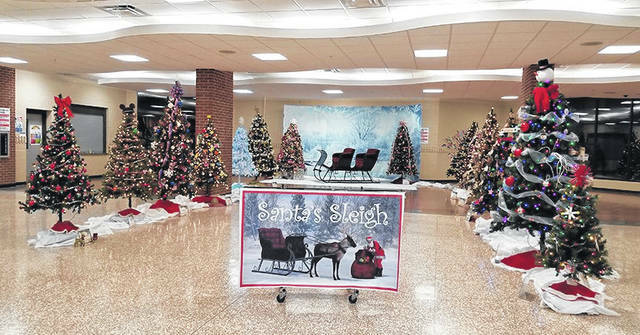 The Adopt-A-Tree program included 15 Cardington student grades and groups who competed in a tree decorating contest with pre-lit artificial trees which later were sold in a silent auction. Judging them were Susie Peyton, Cardington mayor, Patrick Drouhard, retired school superintendent, Brenda Cain from The Depot, SRO Officer Jason Kiefer, Gill Ullom, representing the Cardington Rotary Club, Vivian Owens, representing the American Legion Ladies’ Auxiliary and Trace Russell, local marketer for Costco. In addition, visitors to the bazaar could submit their own votes. The top tree decorators, Team Eighth Grade Washington, D.C. Trip and Team Third Grade, each received a trophy and a donation of $25 from The Cardington-Lincoln Education Foundation. The top two earning trees in the silent auction, Team Third grade and Team Second Grade, were also each given a trophy and the $25 donation. Jenny Zierden, intermediate principal, was in charge of the booth, handling the votes and the silent bids. The silent auction of the trees garnered nearly $1,500. 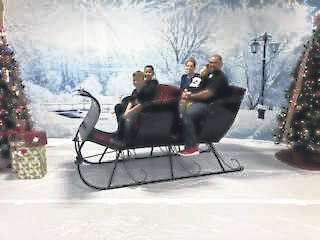 A restored antique sleigh from Kleerview Farm in Bellville, was the background for group and individual photos. There was no charge for these as families took photos with their own cellphones. The Education Foundation sponsored the sleigh and backdrop.